Jo O'Keefe Copyright 2009. 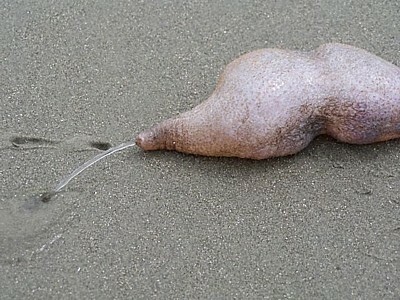 Photos may be used for educational purposes only. Contact me with inquiries. Today Sunset Beach was amazing!. 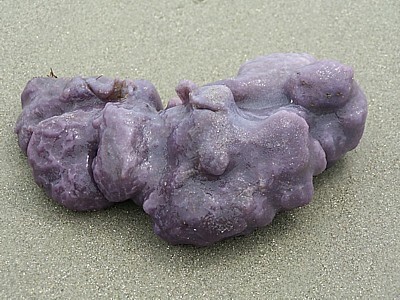 There were many beautiful royal purple colonial tunicates, Eudistoma hepaticum, masses of zooids living together inside a skin called a tunic. 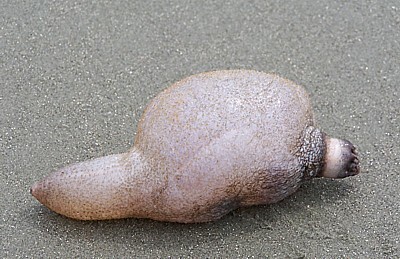 There were plenty of Hairy Sea Cucumbers, Sclerodactyla briareus, left behind by recent storms. Hundreds of them have perished because their food supply is far out in the ocean, as did the hundreds of dead sea stars we saw. I found a few lively ones to show folks and photograph. Here are photos of one. The end with the white ring is the mouth. The sea cucumber extends flower-like tentacles to ensnare minute food from the water such as plankton, phyloplankton, amphipods, and isopods. 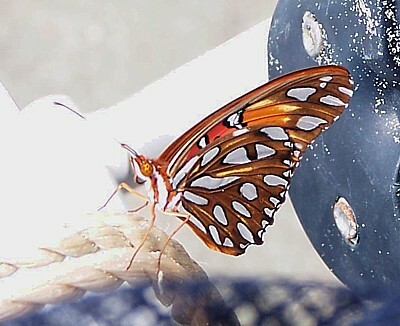 A Gulf Fritillary or Passion butterfly, Agraulis vanillae, rested on my beach cart until my straw hat blew off and frightened it away. A Great Black-backed Gull let me get exceptionally close. Its gonydeal angle, a colored mark on its bill that directs its offspring to food in its bill, is only partially red. Usually gonydeal angles are completely red. 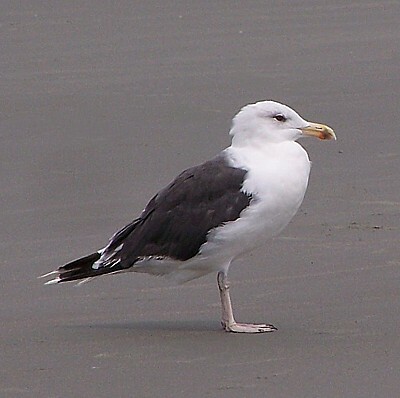 Due to their size, Great Black-backed Gulls are kings of the strand. Finally, a thin little snake put on quite a show. I don't know if it felt threatened by me or wanted to attack me. It jumped high in the air and and right at me every time I tried to take a photo. 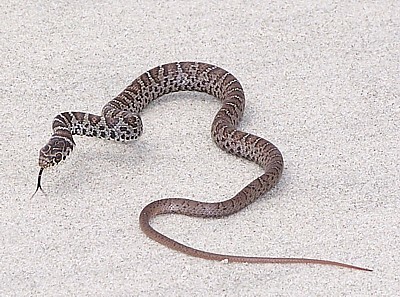 It is a juvenile (recent hatchling) black racer, Coluber constrictor. 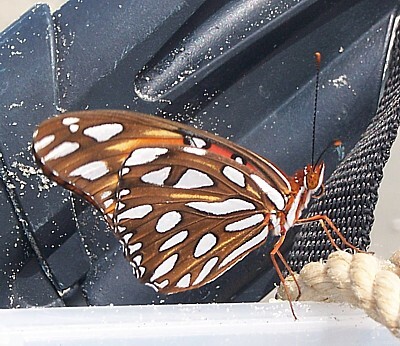 After taking photos, I garnered the assistance of a gentleman to carry him in my largest plastic bin behind the dunes where he would be safe and might find food.